In any meal, the main course comprises the most filling and important part of the meal. The main course is served after the starters or snacks and is followed by the dessert. It may be made up of a single sumptuous dish, or a combination of a couple of dishes. It is common to find Subzis, curries or Dal served with Roti, parathas or rice as part of the Indian main course recipes. On the other hand, dishes like biryanis, pasta, pizzas and baked dishes make up one-dish meals. When planning a menu, one must focus on the main course because it leaves a lasting impression on the diners, being the most comprehensive course of the meal. One dish meals are generally easy to make which ensure you never sleep with an empty stomach as they are also quite filling. Subzis/Sabzis are vegetables , pulses/dals cooked with a myriad of spices and tempered with aromatic, flavorful ingredients like cumin/mustard seeds, curry leaves, asafetida. Indian cuisine is vast and food of every region is influenced not only by locally available ingredients but also, cultural background of the community and seasonal availability. The markets are flooded with a number of gourds like bottle gourd, bitter gourd during summers. Whereas with the arrival of monsoon, the markets brim with luscious, green leafy vegetables like spinach, fenugreek leaves, dill leaves. Winters showcase green garlic, mogri, fresh toovar, yam that are used to make winter special traditional subzis. Vegetables like tomatoes, onion, cucumbers, beetroot are available around the year. Indian flatbreads like roti, chapatti and parathas are mostly made with wheat flour but, you can also make use of plain flour or multigrain flour. They are usually served with subzis and dals or with accompaniments like achaar and curd. Each region has its specific type of flatbread and indigenous ways of making them. Parathas can be made into different varieties by stuffing them with vegetables or a combination of vegetable and cheese/paneer, seasoned with enough spices to make delectable stuffed parathas. Cooking in the tandoor is another aspect widely used for making crispy yet soft flatbreads. Tandoori Naan, Tandoori Kulcha, Tandoori Laccha Paratha, Tandoori Missi Roti and Tandoori roti are some popular flatbreads made in a clay pot oven and tastes amazing with North Indian gravies and Mughlai subzis. Aloo kulcha and Paneer kulcha smeared with butter taste amazing as they are and can be relished as breakfast with a tall glass of sweet lassi. Puris are the perfect accompaniment for certain subzis like aloo bhaji , oondhiya and desserts like shrikhand, aamraas. These deep-fried , piping hot puris are surely soul satiating if not thought about the number of calories consumed. You can even enhance the taste by adding various spices, beetroot/ palak puree or sometimes using different flours and leafy vegetables to make delights like Masala Puris Served with Curds and Chunda a common breakfast in Gujarati households. Spinach Puri, Beetroot Puri, Nachni Soya Puri, Phudina Puri are some variants you can try. For most Indians, lunch and dinner are incomplete without dal or kadhi with rice. Dals are a staple in India. They are lentils cooked and tempered with whole spices and seeds, while some are enhanced using masala pastes. Peppy ingredients like kokum, lemon juice, tamarind are added to give a zingy flavor whereas jaggery /sugar balances the tangy taste. An addition of coconut paste, crushed groundnuts, cream boosts the flavor fourfold. Traditional Indian meals feature dal as it acts like a soupy accompaniment and also provides with the necessary daily nutrients for a healthy body. No matter whether it is prepared as Rasam or as Maa ki Dal, Dal Banjari or as Dal Tadka, every region has its favourite dals and every meal is sure to include a bowl of it! Kadhi is another soupy accompaniment made using curd/buttermilk and besan. The flavor highly relies on the tempering and can be enhanced by adding vegetables or pakodi. Punjabi Pakoda Kadhi from the North , Kokum Kadhi, Gatte ki Kadhi from west, have a look at these wide ranges of Kadhis and try these simple side dish to enjoy with rice, khichdi or sometimes even with roti/rotla. There are numerous types of rice available in India which are used to make different varieties of rice preparation. Basmati rice is used for Biryani/pulao, Surti Kolam is used for khichdi, parboiled rice is used to make idli and dosa batters. They can be served plain or with currys/kadhi and dal or transformed into a delicious one-dish meal. From traditional Biryani, Curd Rice, Khichdi to Creamy Beetroot Risotto, Chinese Fried Rice, Mexican Rice we have them all. Whether you want to cook something in a jiffy or something elegant with elaborate preparation , you can find a rice dish for every occasion. 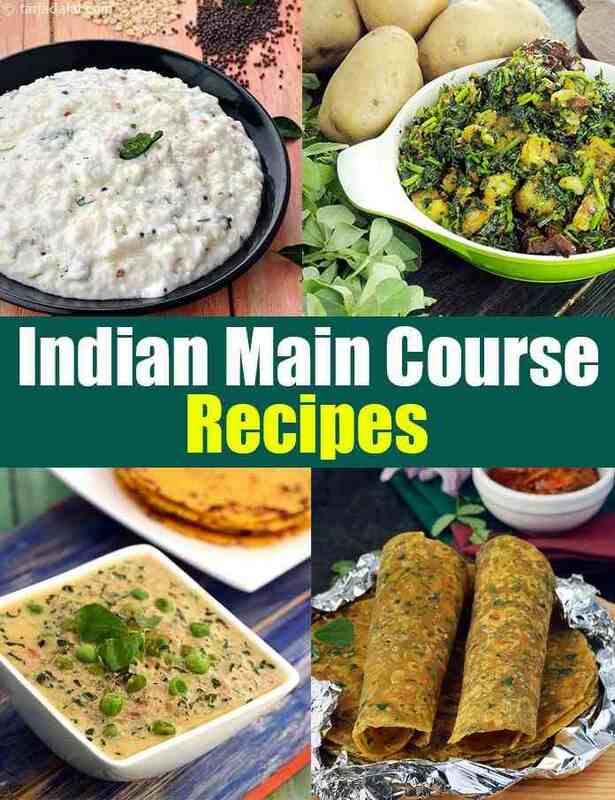 Enjoy our collection of Indian Main Course Vegetarian Recipes given below. A simple, protein packed curry that goes well with curd rice and lemon rice. Green Peas Pulao, tasty and easy to make. This pressure cooked pulao is spiced and aromatic. Sauteing the rice in ghee gives a nice flavour. Interesting combination of garlic ,spices and green peas compliment each other and impart an aromatic flavour to the pulao. Mangodi dumplings are made from soaked and ground moong dal, and when served with methi bhaji curry, hot phulkas and a spicy mango pickle, it makes a true rajasthani fare. Red kidney beans are filling and nutritious. This curry is a favourite in Punjab and loved by all. Instead of the usual tomato gravy, I tried a broccoli gravy and it turned out to be delicious. This makes a wholesome meal when served with chapati, rice, bhatura etc. Stir fried beans, capsicum and tomatoes,quick and nourishing.